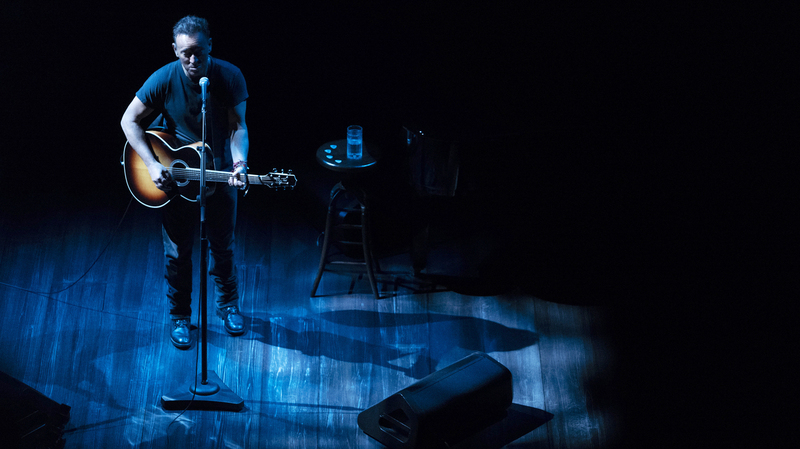 As 'Springsteen On Broadway' Closes, Its Excellent Film Welcomes A New Audience Springsteen has performed his one-man show over 230 times since its debut last year. But, just as the Boss bids adieu to Broadway, a new film documenting the show is set to premiere on Netflix. Bruce Springsteen Springsteen on Broadway, which will have its final date on Dec. 15, 2018. The show has been documented in a new film, to be released just after that final performance. On Saturday night, Bruce Springsteen will perform, for the 236th and final night, Springsteen on Broadway, his intensely personal one-man show at the intimate, 975-seat Walter Kerr Theatre. Just a couple of hours after that, Netflix will make public a document of the show, filmed during a July performance. At the two performances I attended over the course of Springsteen's run on Broadway, one in December 2017 and the other this past September, the show changed little. At each, Springsteen set up the night by telling the audience that he's tinged with the same "fraud" associated with Asbury Park, New Jersey, the boardwalk town where he formed his bands: "I've never seen the inside of a factory and yet it's all I've ever written about. Standing before you is a man who has become wildly and absurdly successful writing about something of which he has had absolutely no personal experience. I made it all up. That's how good I am." It gets a big laugh, but it's not quite true; Springsteen doesn't write about the insides of factories. He writes about the insides of our messy psyches and hearts. Springsteen has been very open, in both his 2016 memoir Born to Run (on which the Broadway show was based) and in recent interviews, about his own internal messes — his struggles with depression and the value he's found in therapy and medication. The stories in his show come from many years of therapy, yes, but they have also been honed over years of onstage storytelling. Springsteen has woven long, often harrowing tales into his stage shows since the early 1970s. If you've followed him a long while, you know that these stories are the ones that won't leave him alone. One of the best introduces "My Father's House," a dark song about unresolved father-son conflict taken from his 1982 album Nebraska. Springsteen and his mother head out to retrieve his father, Douglas, from a bar. The scene he paints of that place — the smoke, the regulars — is full of wonder and fascination, remembered as a "citadel of great mystery" redolent of adulthood, and manhood. But his father, a physically imposing and grotesque figure, with a face "distorted into some booze mask," is an impenetrable wall, unhappy and likely humiliated to have his son in his space. Zimny's thoughtful, subtle editing between extreme closeups and wider shots get at the awkwardness of the story, the shame and heartbreak of seeing a child mediating between parents who can't communicate, and the child's confused awareness of his parents' weaknesses. 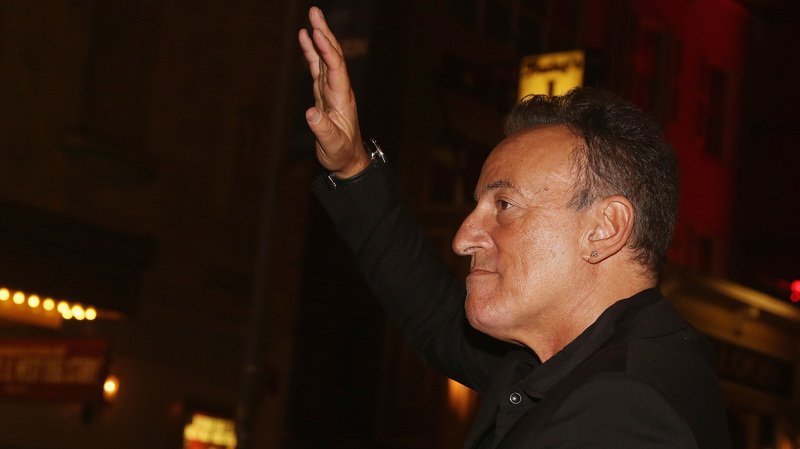 Bruce Springsteen greets the crowd assembled outside of the Water Kerr Theatre in Manhattan on Oct. 12, 2017, for the opening night of Springsteen on Broadway. But a Bruce Springsteen event can't end without some kind of hopeful affirmation. In a story paired with the song "Long Time Comin', " from 2005's Devils and Dust, Springsteen describes his father making an unexpected visit to his house, just before Bruce's first child was born. Douglas finds a way to offer an apology for how he treated his son, and the singer takes it as a warning and as advice for his own impending fatherhood. "We are ghosts or we are ancestors in our children's lives. We either lay our mistakes, our burdens upon them, and we haunt them, or we assist them in laying those old burdens down and we free them from the chain of our own flawed behavior. And as ancestors, we walk alongside of them, and we assist them in finding their own way and some transcendence." After many years as a ghost, Springsteen sees that moment as the one when his father "petitioned for a role" as an ancestor. Zimny keeps the camera close and tight as Springsteen chokes up, slows down and wipes away tears. "It was the greatest moment in my life with my Dad, and it was all that I needed." In one of the show's final speeches, as he looks back on his career, Springsteen says: "I took my fun very seriously." The sentiment encapsulates the central plea of the production, and its film document — there's no escape from Springsteen's assertion that his life story is worth two-and-a-half hours of your time, much of it spent focused tightly on his face. For the whole thing to work — what he calls "my magic trick" in the opening monologue — you have to believe that he means it. You need to want the trick, and to believe the authenticity. Coming after several years of retrospective projects — the memoir, two album-based documentaries and several box sets — Springsteen on Broadway feels like a chapter is ending. The final speech in the film, a look back on his career, resembles a retirement speech. The film gives you a sense, more than the live experience, of how hard it must be to tell these stories night after night. To tell them 236 times. With his 70th birthday on the horizon, Springsteen may have cleared the decks of his own ghosts. What's next? Springsteen on Broadway premieres on Netflix on Sunday, December 16th at 12:01 am PST. An album of the show will be released Friday, December 14th.